Samsung Galaxy S4 I9500 does have lots of great thing to offer but it is not as perfect as people want to. Owners of this phone have reported that their phone won’t charge fully or it won’t charge at all. This is an alarmingly issue that need to deal right away. Do not make jump to any conclusion and thinking that the phone is already damaged. 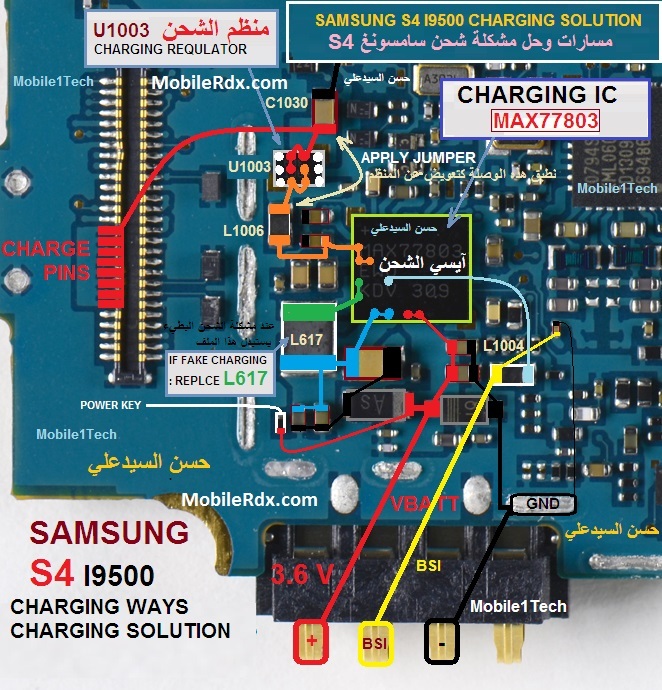 So if you are experiencing any charging problem or problem connecting your Samsung GT-I9500 to your computer via USB cable then it is possible that your Samsung Galaxy S4 I9500 charging connector is faulty. Replacing it with a new one is the only solution here. But if by any chance the USB connector prints are broken then you have to make the jumpers as shown in the diagram below. Charging connector’s pins might be damaged, corrosive or dusty. Charger is out of order or is not original. Battery might be faulty or copy. Battery terminals might be corrosive or damaged. To fix the problem, you may first ensure that the wall charger you are using is properly working and the battery is not totally drained. Continue by checking the charging pin connector or DC jack connector, visually check it for possible damaged. Clean the PCB board charging pads and battery connector. If the problem still occurs proceed to components troubleshooting.